We've been following Novatel's MiFi with bated breath since its December announcement, and the totally pocketable 3G / WiFi router has finally graced a US carrier. Though it'll ultimately come in a variety of physical designs, bands, and radio technologies for different carriers and parts of the world, the MiFi 2200 for Verizon naturally packs CDMA with EV-DO Rev. A, which means uplink speeds should be reasonably speedy to go along with your 1Mbps-plus downloads. Obviously, the concept of a credit card-shaped object connecting up to five WiFi-enabled devices to high-speed internet from wherever the road takes you is an incredibly intoxicating one -- but does the MiFi 2200 deliver? Get the whole story over on Engadget Mobile! 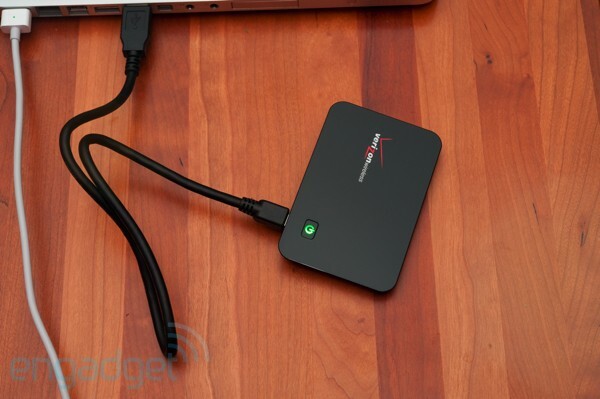 Verizon MiFi 2200 review originally appeared on Engadget on Wed, 13 May 2009 12:01:00 EST. Please see our terms for use of feeds. May 13, 2009 by Ben Pike.